Are you looking for a better way to transport your vehicle? Green Towing provides you with the best quality flatbed towing services in San Diego! Flatbed towing is the only way to transport a vehicle, regardless of size. Flatbeds secure your vehicle throughout the entire journey, so they never jostle around. Green Towing has perfected the art of flatbed towing with a 24/7 accessibility rate. Just give us an address and a time frame, the rest is just a phone call away! Green Towing has a phenomenal roadside crew that works 24 hours a day all throughout the San Diego areas. Green Towing’s super durable flatbeds can easily accommodate several tons in weight capacity. How it works is quite simple. Once the flatbeds are lowered to ground level, your vehicle is slowly raised to the top, so it never makes any contact with the harsh road surfaces. This process is also ideal in preserving the mileage in your vehicle. In addition to flatbed towing, Green Towing San Diego offers; long distance towing, emergency towing, heavy duty towing, wrecker towing, medium duty towing, luxury vehicle towing, motorcycle towing and 24/7 roadside assistance. Do you need a flat tire changed in the middle of the night? Just contact the reliable roadside crew of Green Towing for 24/7 emergency roadside coverage. 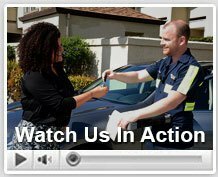 Green Towing can also connect you with a professional auto locksmith in the event of a lockout. You’re always in good hands with Green Towing! Flatbed towing is the perfect towing solutions for anyone looking to relocate. You no longer need to rely on the unstable U-Haul tow dollies. Tow dollies can cause tremendous amounts of damage to your vehicle if the dolly hits a large crater on the road. The crater could actually wind up taking the front bumper off! That’s never the case with flatbed towing, since your vehicle is raised several feet off the ground. Your vehicle remains in pristine condition throughout the trip. Your vehicle is always given the five-star level of treatment at Green Towing. Professional roadside technicians will carefully secure the wheels before taking off. Once the wheels are secured in place, it is then time to proceed to your destination. We follow and obey all traffic signs to ensure maximum protection to your vehicle. Reliability is a very important word at Green Towing. 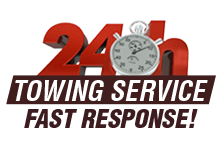 It’s always reassuring to know that you can count on Green Towing 24/7! Green Towing has the distinct honor and pleasure of being San Diego’s most preferred flatbed towing company. It took several years of hard work, effort and customer loyalty to build our prestigious reputation. Green Towing understands the importance of good quality and on-time reliability. Don’t trust your vehicle in the hands of an amateur. Call Green Towing today to schedule a same day pickup and delivery for all local flatbed towing services.